A positive impact message from our Founder, Larry Ortega from his 59 Series. How did One Million NIU touch over 28 million lives? In 1994 we launched the first ever bi-lingual (Spanish/English) Technology Conference (El Dia de Tecnologia). Leaders from across the country convened in Pomona CA to showcase what was then "high-speed" (56k baud modem speed) Internet resources. Soon after ABC7's VistaLA program featured our work in helping youth build a vision through technology. In 1999 on the eve of the dreaded Y2K bug that was going to devastate the world's computers, our kids in Baldwin Park, CA wrote a comic book using PowerPoint and the Internet. With a lot of help from Gus Salazar, Artist and genius behind the images used in the comic book, the impact to the children was tremendous and caused the story to be featured on ABC7. In 2003 the success of our Technology Redeployment Program (TRP) received regional recognition with a feature story done by ABC7"s VistaLA. Back in 2000, at the turn of the millennium, more and more were becoming aware of the advantages of being on-line but lacked resources to buy computers. We started a program that taught youth how to refurbish computers and then redeployed the extras back into the community. 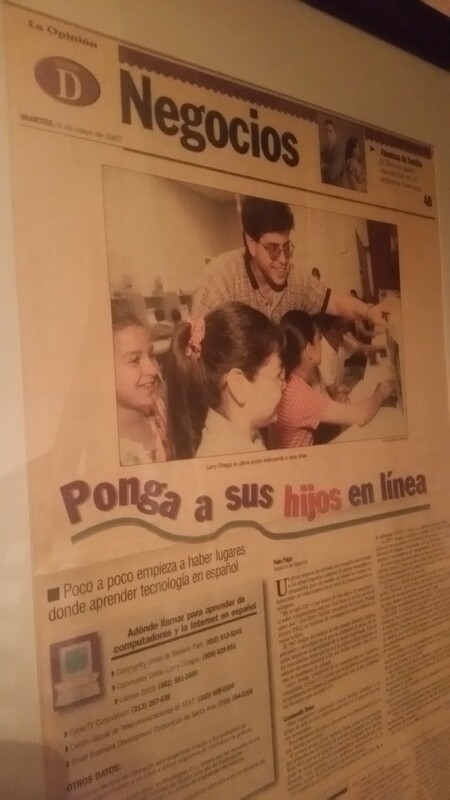 In 2008 the number one morning program in the country, across all languages, Univision's Primera Edicion, decends on Los Nietos Community Center, County of Los Angeles, where we are providing Parent Engagement through Technology for parents to better engage in their child's education. In 2013 Community Union, Inc. celebrated 20 years, recognized the matriarch of the organization, Mrs. Olga Ortega (Larry's mom), brought together key leaders, mentors of Larry, from across the state to cast a new vision on where we go from here. In 2015 the coverage of the MacArthur Park Elementary School (LAUSD) NIU Graduation pushes NIU over a major threshold, officially touching over 28 million lives with their message of broadband adoption leading to improved quality of life. Dozens of newspapers, all of the Spanish TV news channels, ABC7, radio and cable news stations, in 4 languages: Korean, Chinese, Spanish and English, share with the world the impact NIU is making. In 2016 Larry Ortega in his advocacy to get low income families discounted Internet access, makes the front page of the Los Angeles Times business section. In April 2016 Larry Ortega informed parents about campaign to bring discounted Internet service to 100% of the households in urban areas who families are on free or reduced lunch.